Skywork Studios is a specialist in Stereoscopic 3D filmmaking and provides end to end 3D solutions. We ensure that 3D output is of the optimal international quality. 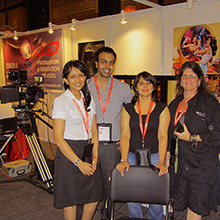 Ashish & Surabhi have moved base to India with a vision to create Stereoscopic 3D films here. 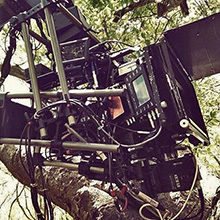 We want to enable filmmakers here to shoot 3D with the same speed and precision as 2D films. We want to help them create groundbreaking experiences in 3D and use 3D creatively as an integral part of story telling. 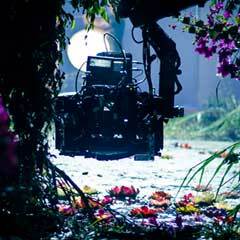 Skywork also provides Camera Rental Services for regular 2D movies. We have the best gear for making a Stereoscopic 3D film in the world today. Our stereoscopic 3D kit consists of fully automated 3ality TS5 Rigs with Weapon Helium 8K Cameras / Red Dragons and Ultra Prime lenses. TS5 3D Rig has been used on films like Transformers 4, Dawn of the Planet of the Apes, X-Men: Days of Future Past, Exodus: Gods and Kings, The Hobbit, The Great Gatsby, The Amazing Spiderman, Step Up Revolution, etc. Our S3D setup provides the most accurate Stereoscopic 3D and high quality 8K footage. Working with the fully automated and accurate setup saves production a lot of time on set, while still achieving the highest level of quality; therefore, saving major costs in production and post-production. Our kit is very versatile and can be mounted onto a Steadicam, Jimmy Jib, Techno crane, Dolly, Panther, Tripod, etc. We have a highly skilled talent pool that accompanies our gear for all the shoots. Being technical and creative are important aspects for a successful shoot. Typically our gear has been put together in consultation with many leading Cinematographers and Stereographers, who know exactly what all is required in the field to make the Film Shoot more convenient with Highest Quality as the primary goal. Ashish is responsible for technically designing the entire Live Action 3D Stereoscopic pipeline for a swift and speedy 3D shoot and he ensures that 3D footage that is delivered till projection is of highest quality every time. He is currently the Live Action Stereo 3D Supervisor and 2nd Unit Stereographer on S. Shankar’s 2.0. He has worked as a 1st unit Stereographer on features like "Pizza" (a UTV (Disney India) and Bejoy Nambiar productions), "Rudramadevi" (the first Indian 3D historical feature) and "Om" (the first IndianCredits 3D action feature). In 2012 Ashish also worked as a Stereographer on a ground breaking technical promo with Real Image (Qube) to do a 120HFR shoot at 5K resolution in 3D. 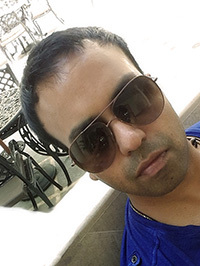 Ashish started Skywork Studios as a Boutique VFX studio back in 2004, after working on films like Spy Kids, Skyline, City Under Seige, etc, he also co-produced films like "The Bunny Tales" (animated film) and "Blood: A Butcher's Tale". Ashish has a Computer Engineering degree from University of British Columbia, Vancouver, BC, Canada. To achieve her goals as a cinematic professional Surabhi has worked in positions ranging from Stereographer, Convergence Puller, Rig Tech / 3D Engineer and Stereoscopic 3D Post Supervisor. She is currently a TS5 Rig Tech and SIP Engineer on S. Shankar’s 2.0. Her credits include "Rudramadevi" (Stereographer for the first Indian 3D historical feature), Convergence Puller / 3D Engineer on "Pizza" (a UTV (Disney India) and Bejoy Nambiar productions), TS5 Rig Tech / SIP Engineer on "Om" (the first Indian 3D action feature) & "Real Image promo" in 3D (shot and projected at 120 HFR in 5K). She studied Design for Communication from University of Arts, London. Surabhi conceived, wrote and created “Evoman”, an animated short film and also wrote the script for “Ink Tripper” (stop motion short film) as part of a group film project. Surabhi is also a graduate of Fashion Design from NIFT New Delhi. She has worked as a Graphic Artist & Fashion Designer with Raghavendra Rathore, who has been one of the leading fashion designers in India. She developed her own clothing and lifestyle brand Bluecow Design Lab back in 2005 and simultaneously free-lanced as a Design Faculty, Fashion Stylist & also had the opportunity to creatively direct Miss Nepal. 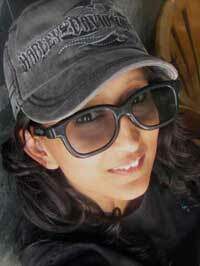 Surabhi joined Skywork in 2009 and the company shifted gears from VFX to Live Action Stereoscopic Filmmaking. Surabhi has dedicated herself to Native 3D films ever since. Skywork Studios started as a Boutique VFX studio back in 2004, after working on films like Spy Kids, Skyline, City Under Seige, etc, he also co-produced films like "The Bunny Tales" (animated film) and "Blood: A Butcher's Tale". Eventually Skywork evolved into making Stereoscopic 3D films, as it is the future of filmmaking, since, as humans we see in 3 dimensions and films should be made as we see in real life. Skywork Studios is a full service camera rental house serving the needs of filmmakers and other creative professionals since 2011. 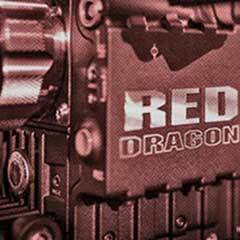 Home to over various complete RED DRAGON, EPIC, Arri Alexa packages, Skywork has a package to meet virtually any need/budget. Live Stereoscopic 3D adds immersion to every frame, that to create real life like images that the audiences can connect to. Emotions, drama, action, fear as they are all heightened due to immersive nature of 3D as well as the surprise/shock value that 3D films offer.